On Thursday it is our School Summer Fayre, starting at 2:30 pm. Please remember school finishes at 2:15 pm and all children need to be picked up promptly so that all staff can get organised for the fayre. 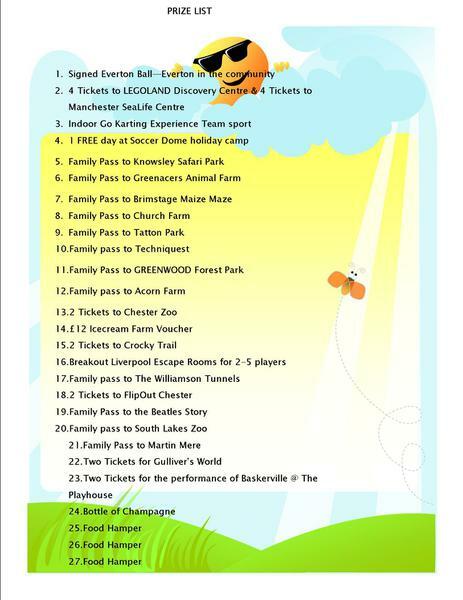 Please find a list of prizes that can be won at this year's fayre. We would like to thank all the companies who have kindly donated prizes this year. Please click the link below to see the pictures from our summer fayre!